Community tanks are fun to watch because of the bursts of colours from fish zipping from corner to corner, complemented by lush green forests of plants and moss, and dancing lines of light from the lighting subdued by driftwood and rock caves. Community fish are like directors, directing the watcher’s eye into what’s worth seeing – the rock work, the meticulously trimmed plants, the spectacular light show, and of course, themselves! Community fish like tetras, guppies, and platys are often the go-to types of fish because of their bright colour patterns, majestic fins, or playful personalities. Unfortunately, this means that quite a lot of fish go under the radar simply because they may not have been given a fair chance to strut their stuff in the pet shop. This list will show you some of the fish you might have seen but have never really “seen” in their full glory. 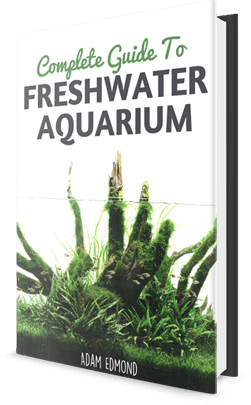 Before we go over the list, here are the some of the things one must take into consideration when choosing fish for your community tank. Kuhli loaches are playful, active little fish that look like tiny eels. Kuhli loaches have often been overlooked by a lot of aquarists simply because they aren’t as popular as Corydoras. The bare bottom minimalist setups in pet stores don’t do them any favours either, as they tend to be more reclusive when there aren’t a lot of hiding places and soft substrates for them to explore or play in. In well-planted plants with sandy substrates, however, it actively scurries around, looking for scraps of food on plant leaves, decor, and other parts of the tank. It doesn’t bother even the most timid tank mates, and it can even be kept with adult freshwater shrimp! Forktail rainbowfish are some of the most striking freshwater community fish out there, with its bright blue eyes, iridescent coloration, and yellow accents on its fins. Their fins are shaped almost like that of a hatchetfish, except that they are less likely to jump out of your aquarium. These fish are quite active and add an impressive splash of colour to any tank, and will not pose any harm to more placid community fish. Threadfin rainbowfish are peaceful, beautiful fish that aren’t often given a fair chance to show off their subtle colourations and splendid fins in a crowded, stressful pet store aquarium. When healthy, these fish display surprisingly intense colours when they spread out their fins, with a bright red glow and a subtle iridescence that contrasts beautifully in a well-planted tank with a dark substrate. They also have small mouths that make them perfect tank mates for smaller shrimp and other small fish. Like the threadfin rainbowfish, the lampeye killifish looks rather drab and unexciting when placed in a poorly-lit, dirty, and stressful tank. 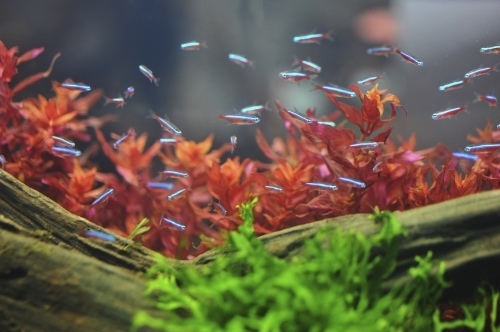 When in a well-maintained well-lit planted tank, however, their eyes display a mesmerising electric blue colour that seem to flash as they zip around the tank. They’re relatively hardy – almost as hardy as guppies and platys, but may be a bit harder to find in pet shops. Glass catfish are unique fish that, much like the ghost shrimp, have transparent bodies that give aquarists a peek into their internal organs. This means you get to see food getting digested with the backdrop of the plant or decor the catfish swims in front of – a rather unique and exciting fishkeeping experience for a lot of people. They’re quite peaceful, but they tend not to move around like the other fish in this list. One could oftentimes see them just staring blankly into space in a dark corner (it doesn’t like bright lights). This fish is nocturnal, so it’ll be more active during the night, and pretty much in a zombie-like state in the morning. That said, it’s a good idea to keep this fish in a well-planted tank with plenty of hiding spots and coves so that it feels safer and will more likely swim out into the open much more frequently. Peacock gudgeons are colourful fish that not all aquarists will readily buy due to their relatively higher price tags. Plain, bare bottom tanks in pet shops also don’t do their eccentric, vivid colourations any favour, either. Like a peacock, it has bright red markings on its metallic blue body and fins. A closer look reveals a captivating, bright yellow outline on its fins. This fish does well either as a pair or as a group of 6 to 8 or more, and will thrive even in small tanks. Take note, however, that while the peacock gudgeon is safe to keep with community fish, it isn’t necessarily going to be safe to keep with small shrimp, as it is considered a micro predator. If you wish to keep them with shrimp, make sure you have a lot of java moss for the shrimp to hide in. The red lizard whiptail looks like a plecostomus with a thin, elongated body and high dorsal fin. What’s interesting about this fish is that nobody’s really sure where this fish truly came from – is it manmade or is it wild-caught? This catfish is also one of the most peaceful yet playful – almost like otocinclus – making them perfect for any community tank. There are plenty of other unexamined, unnoticed community fish out there that merit one’s attention. Fortunately, a lot of aquarists are starting to notice these fish and giving them a chance to add life and beauty to any community tank. Next time you go to a pet shop, take a closer look at the fish you’ve glanced over. Observe their subdued colours, the hidden majesty of their fins, or the dimmed glow behind their eyes; perhaps the most drab fish in the pet store, ends up being the most fab fish in your home tank. After all, more spectacular and stranger things have happened to the most ordinary-looking fish when given a chance to shine.